A VOYAGE ROUND THE WORLD, Performed in the Years 1785, 1786, 1787 and 1788, by the Boussole and Astrolabe, Under the Command of J.F.G. de La Pérouse Published by Order of the National Assembly, under the Superintendence of L. A. Milet-Mureau. in Two Volumes. Illustrated by a Variety of Charts and Plates, in a Separate Folio Volume. Translated from the French. DUPONT DE NEMOURS, Pierre Samuel. Philosophie de l'univers. Troisième édition. Augmentée de plusieurs notes et d'une table des matières. Paris: chez Goujon Fils, 1799 (Fructidor, An VII) - Octavo (196 x 120 mm). 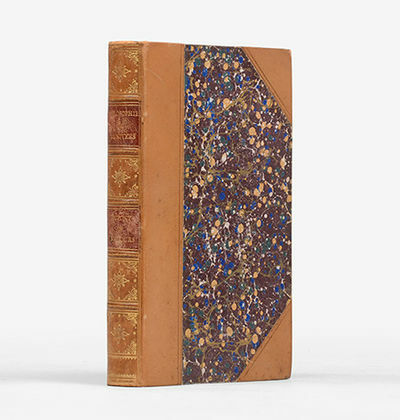 Late 19th or early 20th century half calf and marbled boards by George J. Swayne of Brooklyn, spine decorated gilt in compartments, morocco labels, marbled edges and endpapers. Paper very lightly toned, very occasional spotting; frontispiece a little frayed at top, image unaffected; a very good copy. Engraved frontispiece portrait of the author. Engraved armorial bookplate of Alexis and Elizabeth du Pont of Rencourt to front pastedown. 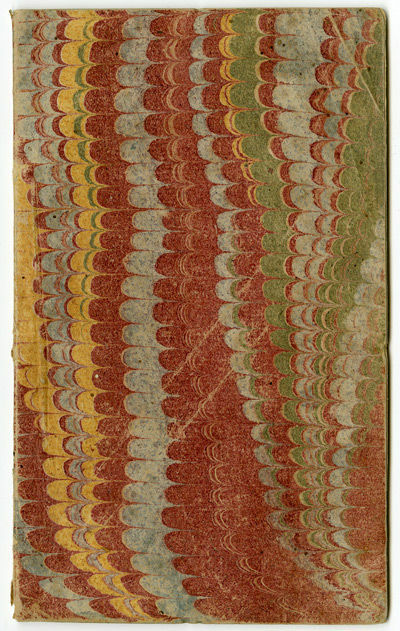 Third and final edition of Dupont's "treatise attempting to state a philosophy of life" (Saricks), first published in 1792 and addressed to his long-time friend Lavoisier. "From the dates given at the beginning of the book, the Philosophie de l'univers was apparently written between December 20, 1792, and June 10,1793. With the Philosophie, Dupont included the Oromasis, a prose-poem which, according to his statement in the preface, was written while he was concealed in the observatory after August 10. 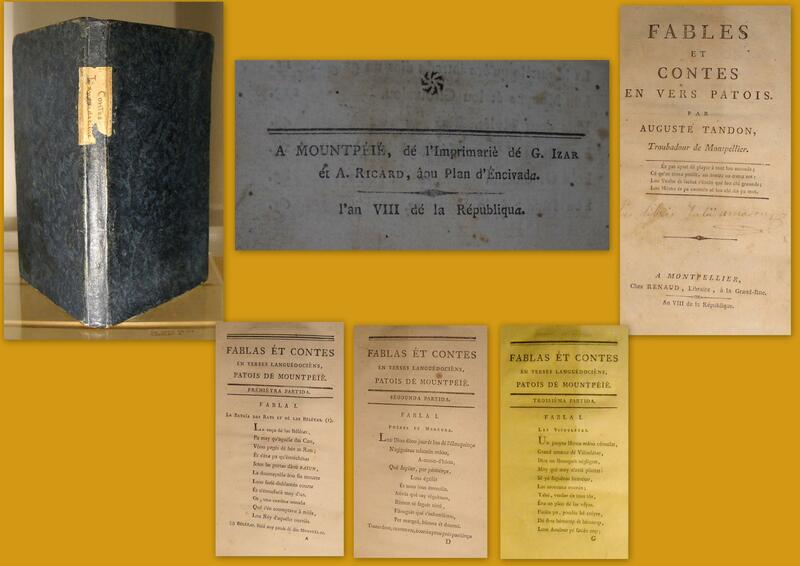 Although of inferior quality, this little work displays the same sublime optimism which Condorcet was able to muster in somewhat similar circumstances while composing his famous essay on human progress. The basis of his 'philosophy of the universe' is that nothing is done by chance. Providential laws direct the whole universe, as accords with good physiocratic doctrine" (ibid.). Einaudi 1673; Schelle 64. Not in Goldsmiths' or Kress. Sowerby, Catalogue of the Library of Thomas Jefferson, 1264, has the second edition, sent to Jefferson in 1798 prior to Du Pont's departure for America. See Saricks, Pierre Samuel Du Pont de Nemours, p.221ff. CRONICAS DE LOS REYES DE CASTILLA. Die Hoffnung bleibt dem Unglücklichen bis ins Grab. (LEsperance soutient le Malheureux Jusquau tombeau). Radierung nach Armand Caraffe. In der Platte signiert, betitelt und bezeichnet. Ausgezeichneter, kräftiger Druck auf Bütten mit Rand um die volle Plattenkante. 24,3 x 33,5 cm (Darstellung). 30,5 x 37,4 cm (Plattengröße). Sauer, Bd. 26, S. 404f. - Während der franz. Revolution tritt Desnoyers in das Atelier von Guillaume Lethière ein. Sein erster Salonerfolg 1799 bringt ihm den "Prix dencouragement" und den Auftrag für obigen Druck nach Caraffe ein, der dann 1801 im Salon ausgestellt wird. Das Blatt wurde lt. Inschrift im Musée Central des Arts verkauft. Mit unleserlichem Sammlerstempel recto unten rechts im Plattenrand. - Vorwiegend im Randbereich minimal stockfleckig, minimale Knickspuren im unteren Darstellungsrand. ondon, 1799 Book. Good. Hardcover. 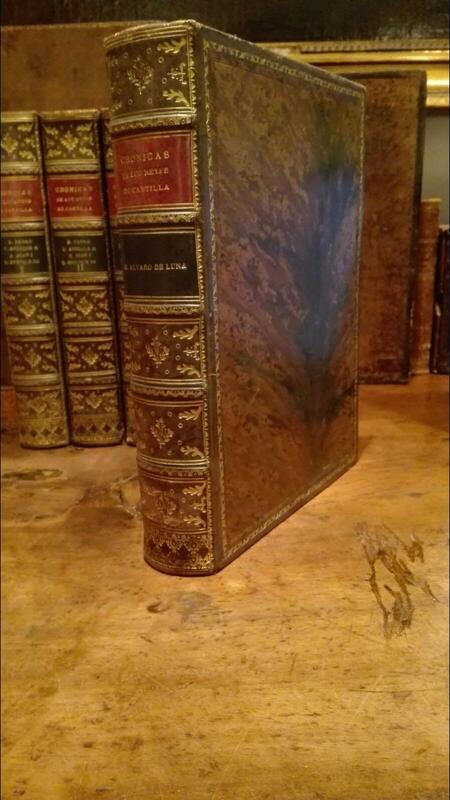 A scarce collection of engravings by English artists. Contains 88 plates of engravings which include topographical views, portraits, emblematic scenes and reproductions of the engraved title pages of other publications. An interesting, if eclectic, collection of 18th century engravings and reproductions. An unusual work. Copac lists a copy held at the British Library, and copies also held at Yale university. All copies have different numbers of plates and the details of plates vary. The work appears to be a collection of plates chosen by the purchaser, intended to display the mastery of English engraving. LIkely the publisher produced a standard set of plates to which the purchaser could add their own choices. With the bookplate of Robert J HayhurstThe title page reads 'from original designs by Stothard, Burney, Harding, Corbould, Van Assen, Potter, Cosway, Paul Sandby, Mather Brown, Catton &C'. In this copy, some of these names have been underlined in early ink, to which has been added the namesVandyke, Bickham, Gillot, Taylorand others. All the plates in this volume are mentioned in the handwritten contents page. This includes several engravings by George Bickhamthe Younger. 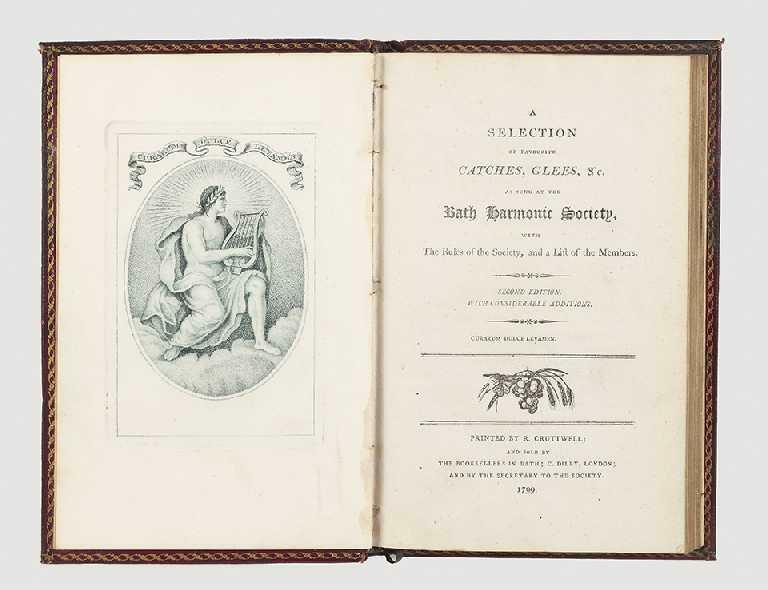 Other illustrations of interest include the two engraved title pages, one from the Lady's Pocket Magazine 1795 and the other from The Infant Vision of Shakespeare 1796. Also of note is an unattributed engraving of Isaac Newton which we have been unable to find reproduced elsewhere. Condition: In a half calf binding with marbled boards. Externally, sound. Marbled boards torn with loss. Front hinge strained after endpaper. Personal bookplate to front pastedown. Internally, generally firmly bound. Pages generally bright with marginal foxing and occasional tidemarks. Title pagefoxed. Occasional neat pencil notes to unattributed plates offering descriptions. Pencil marks to title page and rear blanks and first two plates. Handwritten contents page opposite title page. Handling marks throughout. Overall: GOOD. Mécanique philosophique, ou analyse raisonnée des diverses parties de la science de l'équilibre et du mouvement. Klugheitslehre, praktisch abgehandelt in akademischen Vorlesungen. Band 1 - 2 cpl..
Paris, 1799. 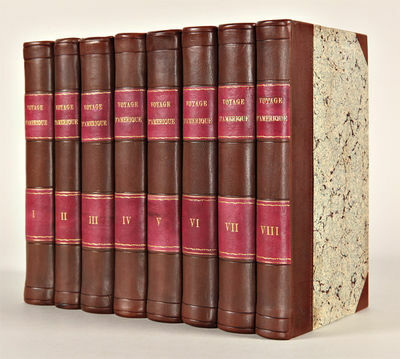 Eight volumes. Three folding maps, nine folding tables. Uniformly bound to style in three-quarter calf and marbled boards. Unobtrusive old blindstamps on each title. Scattered foxing. Map of the U.S. has a very narrow strip of loss (1/16 inch) along the center fold, replaced with reinforcing tissue. Maps of northern and southern sections of the country have some reinforcing tissue on folds. Overall a very good set. An important travel narrative of the United States and Canada in the last decade of the 18th century. The Duc de La Rochefoucauld fled France after his father was killed by a mob in 1793, and spent two years in North America from 1795 to 1797. Arriving in Philadelphia, he travelled overland to Upper Canada, and the latter half of the first and all of the second volume is devoted to his stay there. His published account was considered highly offensive by Lieut.-Gov. Simcoe. 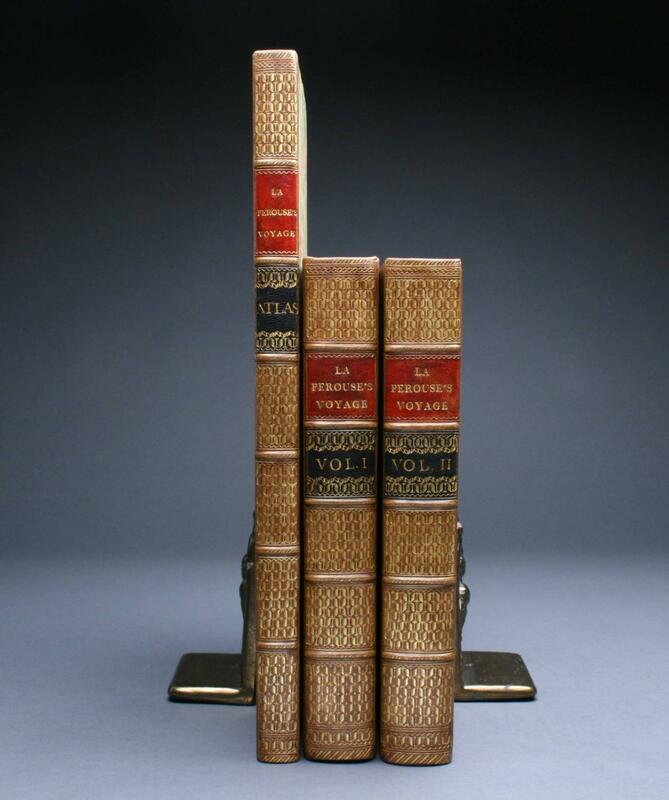 The third volume describes his travels in New England, as does the second part of the fifth volume. The fourth volume and the first part of the fifth narrate his southern tour, which took him as far as Charleston and Savannah, but was largely spent in Virginia, where he stayed for a week with Jefferson at Monticello in the summer of 1796. The author comments extensively on agriculture. A later southern tour, recounted in the sixth volume, took him around Maryland and to the site of the future capitol of Washington. 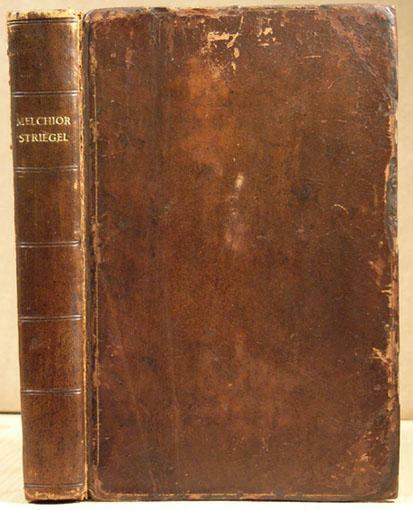 The seventh volume describes travels in New Jersey and his stay in New York, while the last volume offers general discussions of law, culture, etc. Clark refutes judgments of La Rochefoucauld as prejudiced, blaming the poor English translation of 1799, and lauding the book as "a sound, informative account." He also praises La Rochefoucauld's capacity for gathering detailed information, his clear descriptions, and his naming of informants, who include some of the most distinguished men in America. Clark concludes: "It is a profitable work to read." The maps show the North; the South; and all of the United States to date, respectively. CLARK II:103. HOWES L106. MONAGHAN 915. LANDE SUPPLEMENT 1227. TPL 681. CARSON, TRAVELLERS IN TIDEWATER VIRGINIA 133. SERVIES 735 (another ed). Melchior Striegel. Ein heroisches Gedicht. Für Freunde der Freyheit und Gleichheit. Neue verbesserte Ausgabe. 17 Original-Radierungen aus: Moralisch-politischer Kurier. Veduta del Tempio di Cibele a Piazza della Bocca della Veritá. Orig.-Radierung. Bez. "Presso lAutore a Strada Felice nel Palazzo Tornati vicino alla Trinitá de monti. Giovan. Battista Piranesi Architetto dis. ed inc." 63 x 90 cm. (Blattgr.) 40 x 60 cm. (Plattengr.). Papier gebräunt u. stockfl. Kl., untrlegte Randrisse. vgl. Hind 47/III Focillon 820 - Orig.-Radierung aus der Vedute di Roma, an deren Herstellung von insgesamt 135 Tafeln Piranesi 30 Jahre lang arbeitete. 1799 mußten die beiden Söhne Piranesis vor den englischen und neapolitanischen Truppen aus Rom fliehen. Es gelang Francesco und Pietro, nach einer abenteuerlichen Flucht, die gesamten Druckplatten ihrer Werkstatt von Rom nach Paris zu bringen. Dort gründeten sie die Calcographie des Piranesi frères, wo sie in den Jahren 1800-07 "eine sorgfältig gedruckte neue Ausgabe des gesamten graphischen Werks in 27 Bänden veranstalteten" (Wilton-Ely, S. 132). - Blindstempel in der rechten unt. Ecke: "Weiser & Co. Berlin". FABLES ET CONTES EN VERS PATOIS. Vollständige auf Versuche und Vernunftschlüsse gegründete Theorie der Elektrizität für Aerzte, Chymiker und Freunde der Naturkunde. 2 in einem Band. Paris: chez Goujon Fils,, 1799 (Fructidor, An VII). Octavo (196 x 120 mm). Late 19th or early 20th century half calf and marbled boards by George J. Swayne of Brooklyn, spine decorated gilt in compartments, morocco labels, marbled edges and endpapers. Engraved frontispiece portrait of the author. Engraved armorial bookplate of Alexis and Elizabeth du Pont of Rencourt to front pastedown. Paper very lightly toned, very occasional spotting; frontispiece a little frayed at top, image unaffected; a very good copy. 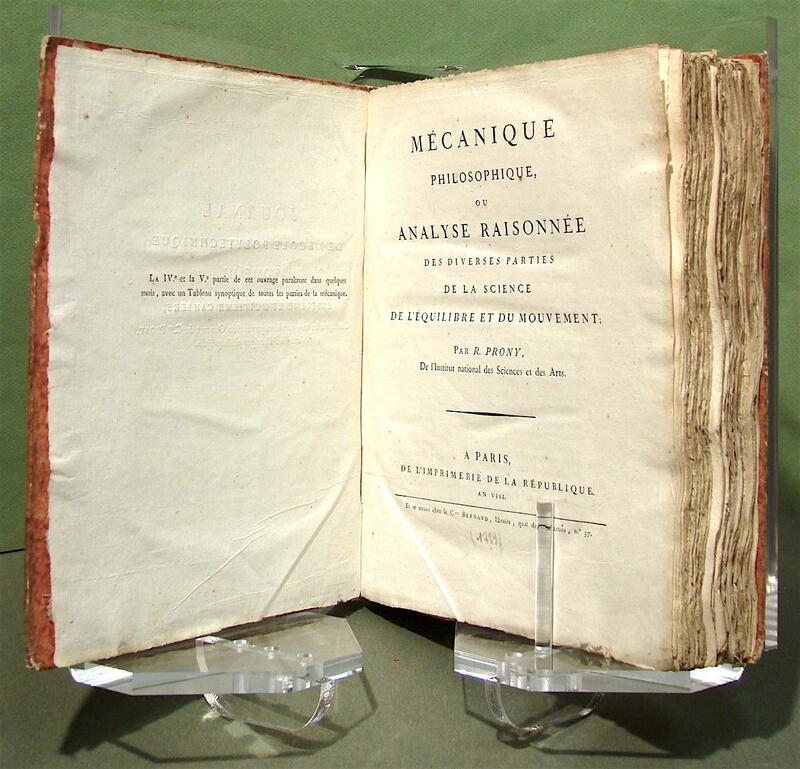 Third and final edition of Dupont's "treatise attempting to state a philosophy of life" (Saricks), first published in 1792 and addressed to his long-time friend Lavoisier. "From the dates given at the beginning of the book, the Philosophie de l'univers was apparently written between December 20, 1792, and June 10,1793. With the Philosophie, Dupont included the Oromasis, a prose-poem which, according to his statement in the preface, was written while he was concealed in the observatory after August 10. Although of inferior quality, this little work displays the same sublime optimism which Condorcet was able to muster in somewhat similar circumstances while composing his famous essay on human progress... The basis of his 'philosophy of the universe' is that nothing is done by chance. Providential laws direct the whole universe, as accords with good physiocratic doctrine" (ibid.). Reise nach Guiana und Cayenne, nebst einer Uebersicht der ältern dahin gemachten Reisen und neuern Nachrichte von diesem Lande. 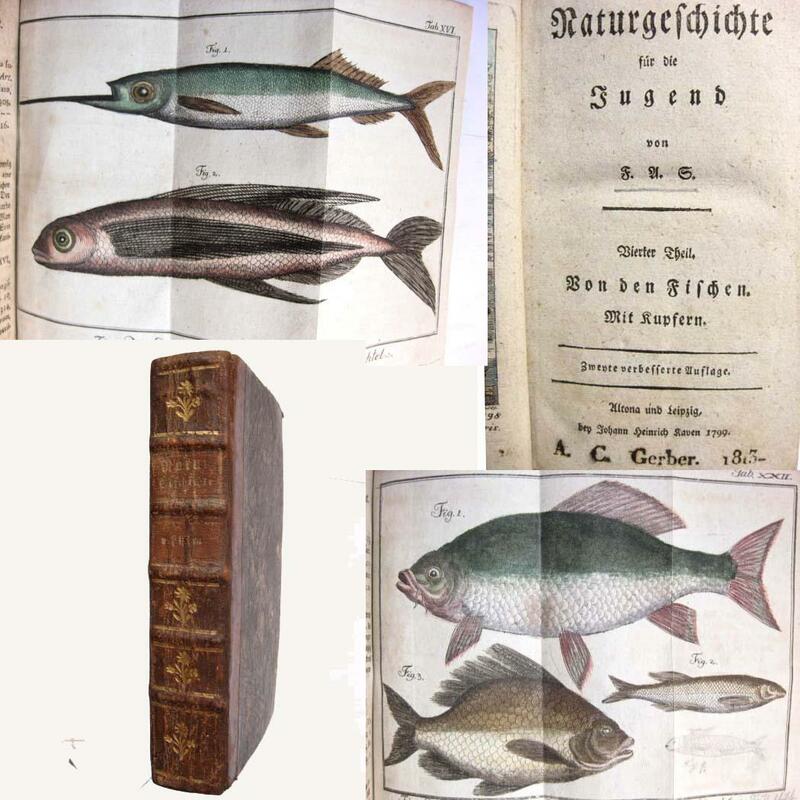 Frankfurt: A. Pichler, 1799 First edition. 8vo ( 16,5 x 10,3 cm). vi, (2), 296 pp. Modern half calf antique style. Gilt-decorated spine. With frontispiece and foldout map. Near fine copy. 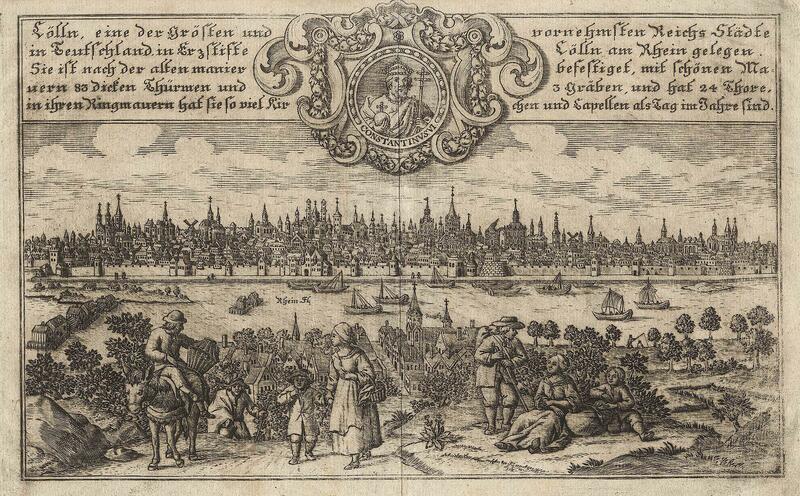 First German edition of an 18th-century account on French Guiana and surroundings with a fine map of Cayenne. For a full description and more images please visit www.zaalbooks.nl . Naturgeschichte für die Jugend. Vierter Theil. Von den Fischen. [WOODWARD, George Moutard]. [ROWLANDSON, Thomas]. 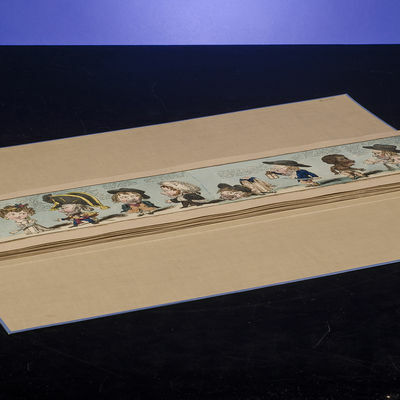 [A Caricature Frieze]. [London: Rudolph Ackermann, 1799] and [London: S.W. Fores, November 9th, 1800- February 6th, 1801]. First edition. Oblong folio (5 x 20 1/4 inches; 126 x 511 mm.). A set of eighteen hand-colored etched caricatures (3 3/4 x 18 inches; 95 x 457 mm. ), and one shorter strip (3 13/16 x 9 7/16 inches; 97 x 240 mm. ), laid down on both sides of card mounts, the mounts joined as a succession of album pages. Panorama style in a blue cloth chemise with black morocco lettering label "Caricatures by Woodward / Ackermann / 1799" on front panel, housed in a blue cloth slipcase with similar black morocco label. 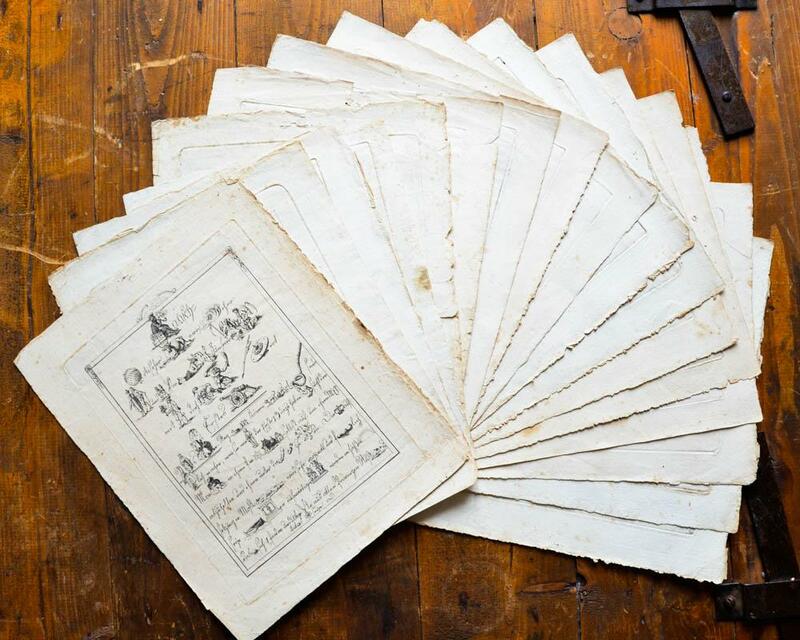 This fine collection of Woodward caricatures contains five plates (of seventy-two) from Grotesque Borders for Rooms and Halls. (London: Rudolph Ackermann, March 28th, 1799 - December 1st, 1800) and fourteen (of twenty-four) plates from Pigmy Revels (London: S.W. Fores, November 9th, 1800 - February 6th, 1801). A fun-filled frieze by the pioneer of the strip cartoon. For Woodward's contemporaries, 'much of the attraction of his work lay in the captions, which relied heavily on wordplay and were sometimes couched in doggerel verse. He tended to choose his subjects from the middle and lower classes rather than high society' (Simon Heneage in ODNB). In the second 'strip' (Grotesque Bordersâ€¦) the wordplay is based on quotations from William Shakespeare. "These figures, mostly with enlarged heads, were designed by Woodward, and etched by Rowlandson, for Ackermann. The strips were apparently intended to be cut apart and used as border designs on walls or screens." (William Gordon, British Caricature, p. 20). 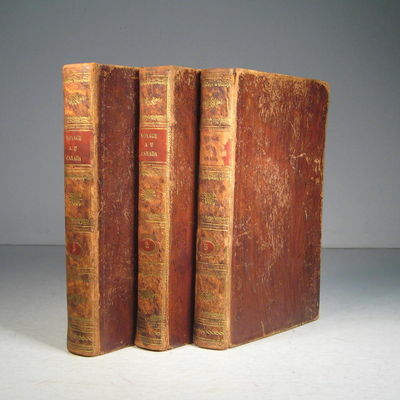 In over fifty years of dealing in rare books I have handled three copies of Pigmy Revels but I have never had any of the plates from Grotesque Borders (DJB). George Moutard Woodward (1760?-1809), "caricaturist, son of William Woodward of Stanton Hall, Derbyshire, was born in that county about 1760. He received no artistic training, but, having much original talent, came to London, with an allowance from his father, and became a prolific and popular designer of social caricatures, much in the style of Bunbury, which were etched chiefly by Rowlandson and Isaac Cruikshank. Although their humour was generally of a very coarse and extravagant kind, they display a singular wealth of imagination and insight into character, and some are extremely entertaining. Among the best are 'Effects of Flattery,' 'Effects of Hope,' 'Club of Quidnuncs,' 'Everybody in Town,' 'Everybody out of Town,' and 'Specimens of Domestic Phrensy.' Woodwardâ€¦was of dissipated and intemperate habits, spending much of his time in taverns, and died in a state of penury at the Brown Bear public-house in Bow Street, Covent Garden, in November 1809" (D.N.B). "Woodwardâ€¦might have rivalled Hogarth. Certainly his collaboration with Rowlandson constituted a lively, if frivolous, commentary on the social scene. Dorothy George described him as 'original, prolific, varied, humorous and good-humoured,' and few students of the subject would dispute her conclusion that his death was 'a loss to caricature' (George, English Political Caricature, 1.174)" (Simon Heneage, 'Woodward, George Murgatroyd [1760?-1809)] Oxford Dictionary of National Biography, Oxford University Press, 2004). Grotesque Borders for Rooms and Halls. London: Rudolph Ackermann, 1799. (Gordon, BC-33 & BC-34). Pigmy Revels. London: S.W. Fores, November 9th, 1800- February 6th, 1801. (Gordon, BC-62, BC-99 & BC-100). Abbey, Life, 462 (Pigmy Revels); Grotesque Bordersâ€¦ not in Abbey. Paris: Imprimerie de Munier, 1799. Cuir. TrÃ¨s bon. 3 volumes in-8, 321, 344 et 294 pages. 1799-1800. Plats refaits, usure aux reliures, une piÃ¨ce de titre manquante. Ex libris en page de garde. Complet de la carte dÃ©pliante, des onze planches, et d'une planche supplÃ©mentaire. Kupferstich - Karte, in 2 zusammengesetzten Blättern, v. John Cary , "A new map of the Russian Empire; divided into its governments; from the latest authorities .". - mit Flächenkolorit, b. John Cary in London, dat. 1799, 45,8 x 98,7 - Blattgr. 57,5 x 118,4 cm Sehr ausführliche Karte, die von der Baltischen See bis zu den Aleuten reicht. - Vereinzelt schwarze Farbspuren oben im Rand, sonst beide Teile gut erhalten. Lit. : Rumsey 1657.040. 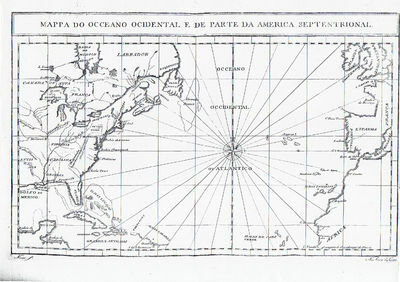 Phillips (Atlases) 714 (Atlas). The Map Collector, issue 43, p. 40-47 (Atlas). National Maritime Museum, v. 3, no. 311 (Atlas). Paris, Lepetit, An VII (1799). 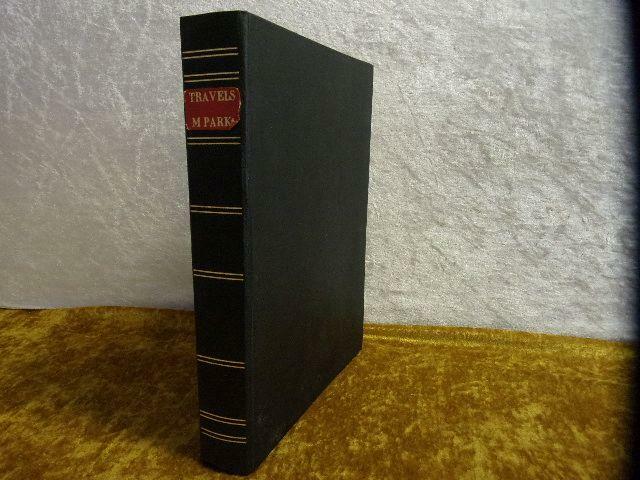 - par James Bruce ; Traduit de l&#146;anglais par P. F. Henry ; Avec atlas composé d&#146;une carte et vingt-deux planches gravées par Tardieu L&#146;Ainé. Mit 22 Kupfertafeln, 1 gefaltete Karte, Lederbämde der Zeit miz rotem Rückenschildern, 13,5 x 8,5 cm, Einbände leicht berieben, die jeweils ersten und letzten Seiten in den Ecken leimschattig. Methode den grauen Staar sammt der Kapsel auszuziehen. Nebst einigen andern wesentlichen Verbesserungen der Staaroperation überhaupt. [Angebunden: 1. Derselbe; Ansicht der staphylomatösen Metamorphosen des Auges, und der künstlichen Pupillenbildung; Wien, Camersinaische Buchhandlung 1805; 146 (1) S. mit 1 kolorierten Kupfertafel. 2. Derselbe; Nachtrag zur Ansicht der staphylomatösen Metamorphosen des Auges, und der künstlichen Pupillenbildung. Wien, Camersinaische Buchhandlung 1806; 20 S. mit 1 Kupfertafel]. Philadelphia: Printed by John H. Oswald, 1799. 22pp. Small octavo. 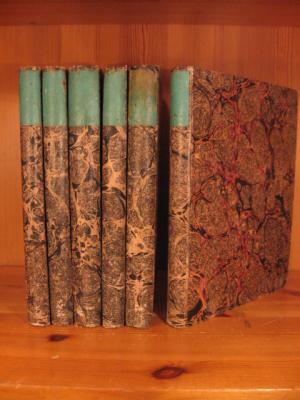 Contemporary marbled wrappers. Top upper corner of last several leaves torn off, with no text loss. Good. Lays out the duties of the Speaker of the House, and procedures regarding bills, the Committee of the Whole House, and joint rules and orders of the House and Senate. The lengthiest section covers rules of decorum and debate, appropriate as these rules were published the year after Rep. Roger Griswold attacked Rep. Matthew Lyon with a hickory walking stick on the floor of the House. NAIP locates only seven copies. Scarce. EVANS 36590. NAIP w027052. Die Spinne als die beste Wetterprophetinn, welche die bevorstehende Veränderung des Wetters mehrere Tage voraus ankündiget.Munich, Joseph Lindauer, 1800. 8vo. With a folding letterpress table. Later marbled boards. VD18 15333019; WorldCat (1 copy); not in Horn & Schenkling. Rare first edition of a study on the behaviour of spiders by the German Joseph Schmidt, honorary member of the Botanical Society of Regensburg. He explains that spiders react to weather changes, and from studying this behaviour Schmidt was able to predict the weather several days forward. The treatise is a reaction on Quatremere Disjonval's Neueste Entdeckungen über die Natur der Spinnen und vorzüglich über deren Verhältniß mit den Veränderungen in der Atmosphäre (Berlin, Leipzig, 1799). Slightly browned, letterpress table loosely inserted, otherwise in very good condition. Georg Ludwig Böhmers auserlesene Rechtsfälle, aus allen Theilen der Rechtsgelehrsamkeit, nach dessen Tode gesammelt und hherausgegeben. 3 Bände (in 6 Bänden). 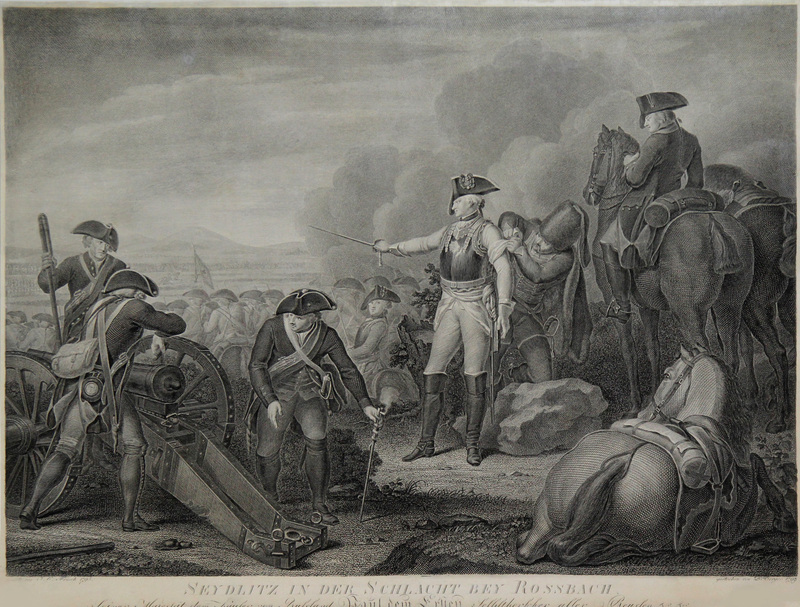 Göttingen, Vandenhoek und Ruprecht, 1799 - 1802. Fallsammlung von insgesamt 253 Rechtsfällen des Hallenser Juristen und Straf- und Kirchenrechtlers Georg Ludwig Böhmer (1715 - 1797). Alle Bände in jeweils zwei Abteilungen, alle Bände (bis auf Band 1/1) mit Inhaltsverzeichnis und ausführlichem Register. In der ersten Abteilung des ersten Bandes Inhaltsverzeichnis und Titelblatt fehlend, hier ebenso fehlend bzw. nikcht beigebunden die Fälle Nr. 44 bis 48 (= S. 329 - 360). Boehmer lehrte von 1740 an zu nächst als außerordentlicher Professor, von 1742 an als ordentlicher Professor an der kurz zuvor gegründeten Universität Göttingen 1770 erlangte er den Titel eines Geheimen Justizrathes. Böhmes juristisches Hauptinteresse galt dem Zivilrecht, Lehnsrecht und Kirchenrecht. Sehr gutes Exemplar dieser sehr seltenen juristischen Fallsammlung, in der sich die Rechtspraxis des späten 18. Jahrhunderts in ihren unterschiedlichen Facetten widerspiegelt. Titelblätter und letzte Seiten partiell etwas gebräunt bzw. fleckig lediglich Seiten sonst sauber und fleckenfrei. Weitere Fotos auf der Homepage des Antiquariats (bitte Art.-Nr. auf der Angebotsseite in das Suchfeld eingeben). 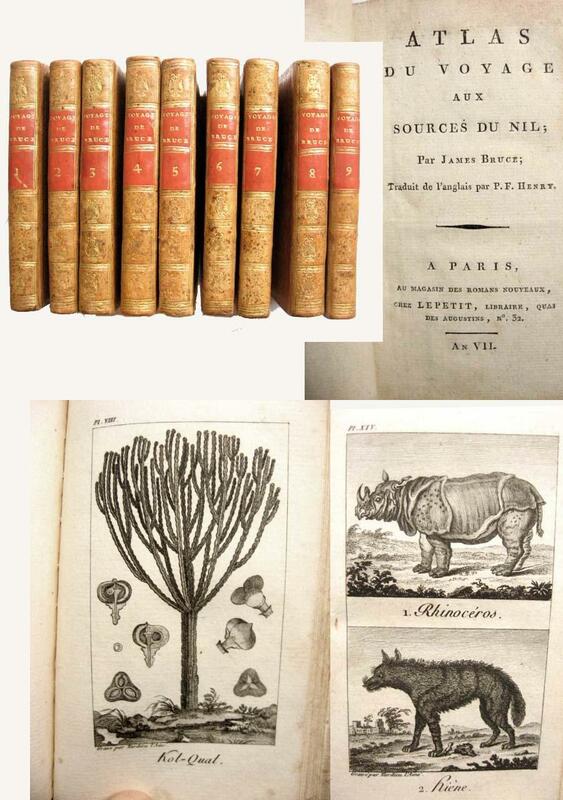 Travels in the Interior Districts of Africa: Performed Under the Direction and Patronage of the African Association, in the Years 1795, 1796, and 1797/. . ./ With an Appendix, Containing Geographical Illustrations of Africa. By Major Rennell. Dansk Læsebog og Exempelsamling til de forandrede lærde Skolers Brug. Bind I-II. Kjøbenhavn, Johan Frederik Schultz, 1799-1804. VIII + (6) + 552 + VIII + (4) + 611 s.Samt. skinnbd. med fem opph. bind. Ryggdekor i gull. Ubeskåret. Ex libris på forsats (Oscar Davidsen). Bibl. Dan. IV, 73. Fra Biblioteket på Gjorslev. John & Arthur Arch, 1799. Hardcover. Very Good. 1799. 76 pages. No dust jacket. This is an ex-Library book. 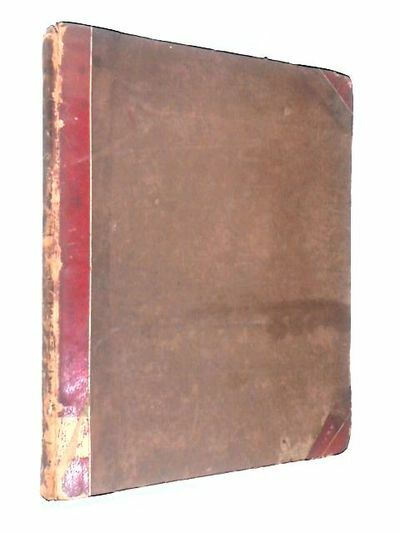 Brown boards half bound in red leather with gilt lettering to spine. This is an former library book, with stamps to pages and a small label to front pd. Inscription to title page. Pages are mildly tanned and foxed, with occasional use marks. Text and illustrations remain bright. Moderate scuffing to outer binding, mainly to leather areas. Few small losses to edges. Mild damp stains and minor general use marks present. Binding remains firm. Many fine double-page woodcuts. 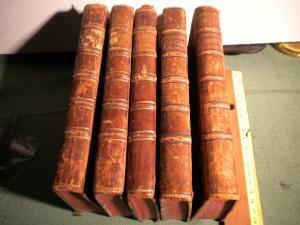 Six vols. 8vo, orig. thick embossed wrappers (a little worn), orig. block printed title label on each upper cover, new stitching. Kyoto: Preface dated 1799. 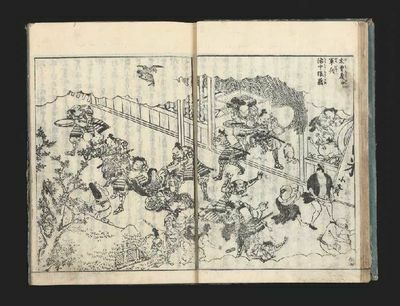 First edition of this famous, finely illustrated, fictional tale of the Gempei War (1180-85), the final struggle in Japan between the Taira and Minamoto clans which resulted in the Minamoto's establishment of the Kamakura shogunate, a military dictatorship that dominated Japan from 1192 to 1333. Akisato (fl. 1780-1814), was the first to write detailed accounts of early Japan. He travelled with his artists throughout the country in order to accurately record the landmarks; his books were immediate best sellers. The illustrations are by Chuwa [Baikei] Nishimura and Sadaaki [Bunmei] Oku, two of the leading illustrators of the period. Very good set. - Kupferstich aus Sächs. 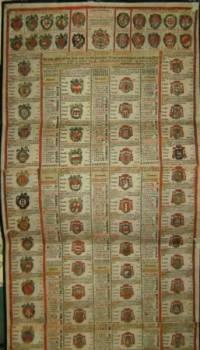 Postillion, um 1799, 18 x 29,5 Sehr seltenes Blatt. Oben mittig ein Portrait von Constantin VI, rechts und links davon eine kurze Stadtbeschreibung in 5 Zeilen. Phantasien über die Kunst. für Freunde der Kunst. Herausgegeben von Ludwig Tieck. Phantasien über die Kunst, für Freunde der Kunst. Herausgegeben von Ludwig Tieck. Kalkar 03. 02. 1721 - 08. 11. 1773 Ohlau, Schlesien). Freiherr. "Friedr. Wilh. von Seydlitz.". "Seydlitz in der Schlacht bei Rossbach" (1757),. - Kupferstich v. D. Berger n. J.G. Fritsch, dat. 1799, 42 x 59 Dargestellt ist Seydlitz (stehend) inmitten seiner Truppen. Ein Soldat verbindet seinen linken Arm, der rechte Arm hält den Degen. - Fachgerecht restauriert, mit Buchstabenverlust an der Legende unten. Teilansicht, Ansicht, "Vue de la porte sainte et de ses environs à Moscou". - Kupferstich v. Laminit n. Guerard de la Barthe aus Walser, Russ. Prospekte, 1799, 39,2 x 65,4 Thieme-B., II,546(B) u. X,410(E). - Seltene Ansicht aus Walter's Sammlung russischer Prospekte. - Unter der Ansicht Beschrebung in russ. und franz. Sprache. Im Vordergrund zahlr. Personen. Histoire de Mathematiques. Hier in 4 Bänden komplett ! Histoire de Mathematiques. Dans laquelle on rend compte de leurs progres depuis leur origine jusqu'a nos jours ou l'on expose le tableau et le developpement des principales decouvertes, dans toutes les parties des Mathematiques, les contestations qui se sont elevees entre les Mathematiciens, et les principaux traits de la vie des plus celebres. Nouvelle edition, considerabliment augmentee, et prolongee jusque vers l'epoque actuelle. Oekonomisch-technologische Encyklopädie, oder allg. System der Staats- Stadt- Haus- und Landwirtschaft und der Kunstgeschichte in alphab. Ordnung: 76. Teil von Lein bis Leinzieher. 8. 2 unbedr. Bl. (neu eingefügt), Titelbl., 7 nn. Bll., 373 (=371) S. (Seitensprung v. S. 360-363 ohne Textverlust), 21 nn. Bll., mit e. Druckermarke am Titelblatt u. e. Holzschnittporträt des Lemnius am Titelblatt verso, mit großen u. kleinen Initialen, Schlußvignetten, sow. 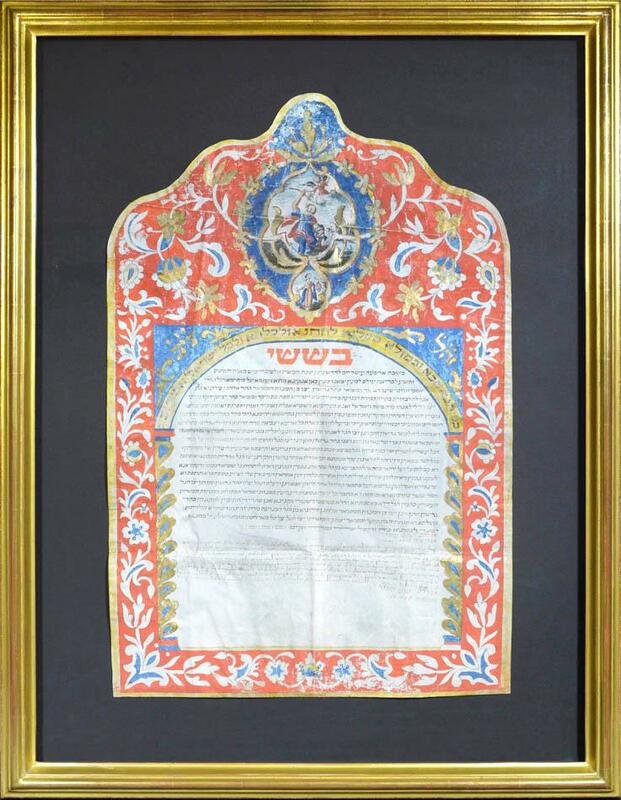 e. Druckervermerk am Schlußblatt verso (J. Withagen). Halblederband aus späterer Zeit, mit e. schwarzen goldgeprägten Rückenschild, sowie schöner Rückengoldprägung, Einbanddeckel marmoriert, Vorsatz gesprenkelt, stärker berieben, bestoßen. Titelblatt fleckig, e. Tintenfleck am zweiten ungezählten Blatt, Schlußseiten wasserrandig. Mit verblasstem Stempel, sow. kleinen Schriftzügen v. alter Hand am Titelblatt, e. Namenszug v. alter Hand u. e. Besitzstempel, kombiniert mit handschriftlicher Numerierung am zweiten unbedruckten Blatt avers u. e. Schriftzug v. alter Hand in Tinte (Anno 1799 procuratus) u. e. in Bleistift verso, mit gestochenem Wappen-Ex-Libris. BSB-AK 22,218. Vgl. Durling 352,2770. BM: Dutch Books 115. Jöcher 2,2359. Ferguson II,22f. - Hauptwerk des L. (auch Lemmens 1505-1568), d. Theologie, Philosophie u. Medizin unter Vesalius studierte. Seltene Ausgabe, bei Adams, Durling (Cat. of 16. Century Printed Books in the Nat. Library of Medicine) u. B: Dutch Books nur andere, v. W. Simon besorgte, Antwerpener Ausgaben verzeichnet. Erste vollständige, um zwei "Libri" ergänzte Ausgabe. 12. 2 Bll., 178 (1) S. HLdr. d. Zt. m. hs. Rückensch. Berieb. Durchgeh. leicht stockfleckig. EA. H. de Balzac (1799-1850). "Au 8 octobre 1838 Balzac publie Les Rivalités en province dans Le Constitutionnel (huit chapitres en onze feuilletons), sans faire allusion à la publication précédente, dont celle-ci est pourtant la suite. Mais le roman se dénoue rapidement après lintervention de Chesnel auprès de Mme du Croisier" (Gisèle Seginger). Der Roman erschien einJahr später unter dem endgültigen Titel "Le Cabinet des Antiques" bei Souverain 1839. Die vorl. Ausgabe ist noch mit dem Titel Les Rivalités en Province davor erschienen! Philadelphia: Printed for the Author by Way & Groff, . First edition. 1799 - Pp. xviii, 24. Recent brown cloth, letter in gilt on the spine, lg 4to (11 1/4 x 9 inches). "This work deals predominantly with the migratory birds, arranged according to the dates throughout the year 1791 on which they were first seen in the neighborhood of Philadelphia. Barton also notices and describes the concurrent state of the vegetation" (MacPhail - The Sterling Morton Library Bibliographies in Botany and Horticulture). Mengel notes this work is "one of the rarest of American ornithological works and the first entirely ornithological paper on American birds written by an American" (Ellis/ Mengel 179). Coues recognizes the work as "one of the most notable treatises on North American ornithology of the last century" (Coues 1: 592). It is easy to see that this slim volume is starting point for the entire field of North American ornithology. 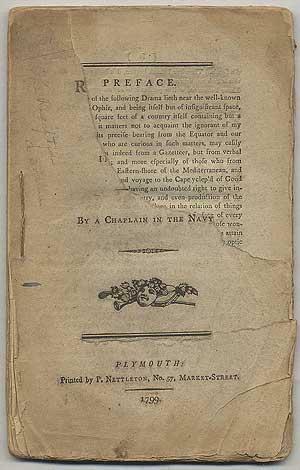 The original printed wrappers are not present in this copy and the outer page edges have been slightly trimmed - though the margins remain wide. No ownership marks and few signed of use. The last page of the text and the following blank page show some light browning, bottom outer corner of the title page and the following few pages has a one-quarter inch piece missing, inner gutter tear on page 22 is neatly repaired; this small points aside, this is a remarkably well-preserved copy in very good condition. Nieuwe zak- en reis-atlas der Bataafsche republiek; ingericht naar deszelfs verdeeling in Departementen en Ringen; als mede, naar die in 94 districten. 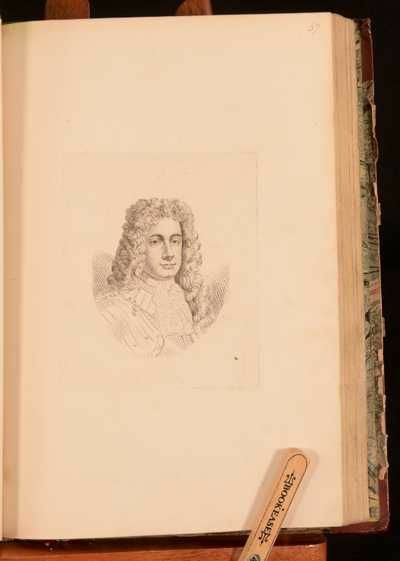 Amsterdam: Mortier Cóvens en Zoon, 1799 First edition. Folio (28 x 20 cm). Contemporary half calf. Gilt lettered red morocco label. With 17 two-page hand-coloured maps of the Netherlands. Fine copy. Nice atlas of the new Batavian Republic, originally published in 1799 with 10 maps, but now (in 1800) enlarged with 7 maps. For a full description and more images please visit www.zaalbooks.nl . Früher eigenhändiger Brief ohne Unterschrift an einen Grafen. 23 x 19 cm. 4 S. auf Doppelbogen Hadernbütten mit Wasserzeichen. gute Erhaltung. Montgelas war von 1799 bis 1817 Minister unter dem Kurfürsten und späteren König von Bayern Maximilian I. 1786 trat M. in den Dienst des Herzogs Karl II. August von Pfalz-Zweibrücken. Als die Franzosen 1793 Zweibrücken besetzten, blieb M. nach der Flucht Karls als herzoglicher Beamter zurück, um zwischen den fremden Truppen und der Bevölkerung zu vermitteln. Bei Karl II. fiel er in Ungnade, nachdem er sich unter Rettung des herzoglichen Archivs nach Mannheim durchgeschlagen hatte. Nach Karls Tod stellte dessen Bruder und Nachfolger Max Joseph 1796 M. als politischen Berater ein und nahm ihn 1799 mit nach München. Übersetzung: ... Die Franzosen haben das Schloss von Worms angezündet, haben einen großen Teil der Kontribution, die sie den Einwohner auferlegt hatten, erhoben, und haben danach diesen Ort am 24. dieses Monats verlassen. Briefe des Generals Graf von Isenburg, der in Ihrem Hauptquartier Mainz ist, kündigen die Räumung von Frankenthal für heute an. Die Dörfer jenseits des Rheins, die zu uns am nächsten sind, sind immer noch vom Feind besetzt. Ihre Exzellenz kennen die Geschichte von Fort Louis. Man weiß nicht genau, wo die Hauptmacht der französischen Truppen ist, und ihr Hauptquartier. Uns ist gestern ein Bataillon Bayern angekommen, wir erwarten für heute ein zweites, so sehr wie es gestattet ist, nach dem Anschein zu urteilen. Denn Sie wissen, Monsieur le Comte, dass derartig außergewöhnliche Dinge geschehen, dass es unmöglich wird, etwas vorherzusehen. Der Feldzug scheint auf unseren Seiten beendet zu sein. Man hat Unruhen in Italien und den Niederlanden. Die Landung der Engländer in C... war erneut in einem Brief aus London angekündigt worden, der dem General Prinz von Waldeck zugekommen ist, aber ich bezweifle noch, dass dies Erfolg hat. Wir wurden darüber so oft getäuscht, dass es sehr wohl erlaubt ist, nicht mehr leicht daran zu glauben. Dies wäre jedoch das einzige und wahre Mittel, uns das Ende zu verschaffen, dass wir alle so sehr wünschen müssen, und so wie wir Grund haben, es zu wünschen. Eine Versammlung so nahe der Hauptstadt und unterstützt von den Unzufriedenen des Inlandes hätte mehr Wirkung als der notwendigerweise blutige, lange und kostspielige Angriff der Grenzen. Die zwei Generale sind noch nicht eingetroffen. Es tut mir leid, es zu schreiben, aber von den Kommandanten bis zum letzten Soldat ist nur ein Schrei nach Frieden. Sie rufen nach ihm mit all ihrer Kraft und sind der Feindseligkeiten sehr müde. Ich bitte Ihre Exzellenz diese Einzelheit für sich zu behalten, aber die Beobachtung ist genau, und ich weiß, dass Sie ein getreues Bild mögen. Viele beginnen daran zu zweifeln, dass der König zur Armee kommt. Man spricht von Verhandlungen und ... zwischen Ihrem Hof und jenem von Wien zugunsten des ersteren. Was hat es mit den russischen Bewaffnungen am Schwarzen Meer auf sich? Möchte die große Katharina den Besonderheiten dieses schrecklichen Jahrhundertendes die Krone aufsetzen, indem sie den günstigen Augenblick nutzt, um ihr berühmtes orientalischen System zu verwirklichen? Der liebe Onkel war zwei Tage lang krank ... Unser Meister ist wegen einer starken Erkältung unpäßlich, die, ohne dass sie gefährlich wäre, ihn gezwungen hat, seine Reise nach München zu verschieben. Die bittersten Gedanken drängen sich über die elende Lage auf, in der wir uns befinden, und die sehr realen Gefahren, in denen sich die bürgerliche Gesellschaft befindet. Mein Herz ist schwer wegen dem was ich verliere, wegen dem, was ich erleide, mehr noch wegen dem, was ich fürchte. Es wird mir letztendlich ein großer Trost sein ... zu erfahren, Monsieur le Comte, dass Sie ruhig und zufrieden sind, und Sie mich beständig mit einer Freundschaft beehren, die mein Glück und mein Trost sein wird..."